Curved staircases are not spiral stairs. Spiral stairs are defined as steps wrapping around a center column. Curved stairs have no center column. Curved staircases are usually built with bent stringers. Stringers can be channel, plate or box material. Stringers can also be placed on either side of the steps or under the steps, all of which changes the appearance. Stringers can also have a smooth top and bottom or have a cut out to form the rise and the run (eg. saw tooth). Curved staircases, much like spiral staircases, can be customized to suit any building style. Over the years, Stairways, Inc. has produced curved stairs using steel, wood, aluminum and stainless steel. 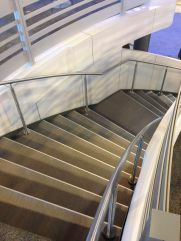 These stairs can be used in interior or exterior applications. Commercial, industrial or residential projects can all utilize these beautiful staircases to add flowing lines. Contact Stairways, Inc. for design ideas and layout information.